That's right, CoDOL features characters from past Call of Duty games, among many other bygone things. It was a nice surprise, and that's what's so great about CoDOL, it's a surprise. The game was kept under lock and key for the better part of 2012 and 2013, until it went into private testing. After 2014, and a series of closed tests, the game is finally in public beta. Now in China, when a game goes into the coveted public test, the game is fully playable, albeit with a few bugs here and there. So after two and a half years and two New CoDs already out on console, is CoDOL any good? Well, I did say it was a surprise earlier, and I meant it. The game is broken down into six different modes, some with a subset of modes, for example Deathmatch mode has Team Deathmatch. The two modes that are straightforward are the single-player campaign and the training mode. The single player campaign was a shocker—but more on that later. For now, let's start breaking down the game into what's good and what's bad. Keep in mind this is far from the finished products western gamers are used to with console launches (though not as of late). This is a very close to finished, definitely playable and respectable product. This one's not exactly good but not exactly bad. I tend to see it as good. Graphically, it's not the same as what you would find on your PS4 or Xbox One or souped up gaming PC. No, this is an online game meant to reach the masses, but CoDOL's graphics are more than passable. If we compare it to, say, the likes of a Chinese competitor, like Glorious Mission or Crossfire, CoDOL would be considered Next Generation! Looking at CoDOL's recommended specs shows that the game requires some muscle to run, but it's definitely not out of the range of the average net cafe in China, which is a good thing. Tencent knows how to mass market to the Chinese consumer and keeping things runnable on even old hardware is a good way to bring in more gamers. I believe more gamers equals better play time. Like I mentioned a couple times so far, CoDOL is a surprise, a delightful surprise, and the single player mode has a lot to do with it. Players take control of a newbie character that they created and partake in missions similar to Spec-ops missions in Modern Warfare, though the missions are connected via a plot. The plot? Take down the terrorists. What makes the campaign special is that it's a good way to not get frustrated after playing the multiplayer, and it's an easy way to level up your character and learn the game. On top of that, it also tugs at the heartstrings through nostalgia. Remember Soap, the player character from Modern Warfare, Ghost from Modern Warfare 2, and Price? They're all back and they play pivotal roles in the story. It's as if they never left. One of my biggest gripes with shooters is how good the game feels. How it controls (not the literal controls themselves, mind you), how the shooting works, how the player is alerted to being shot at, and these are all things that COD has excelled at over the years. CoDOL through everything is definitely a COD game. The game has the same tight controls, the fast reaction and knifing action you'd expect to be found in Modern Warfare 2. On top of the physical and metaphysical feel, the artwork also felt very COD, with the bulky marine-type character models. The only complaint I can add is that there seems to be an "Asianification" of the models, which does make sense. The biggest draw of CoDOL and is its multiplayer. 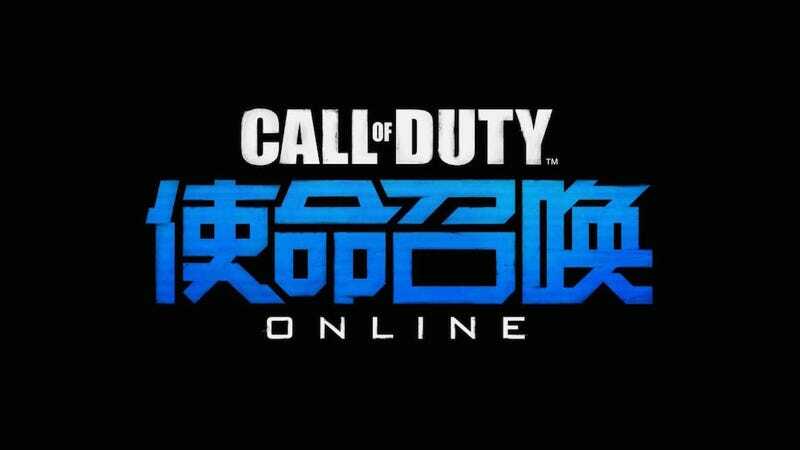 Chinese net cafes, and Chinese games for that matter, are all about multiplayer games. While its single player campaign is cool and nostalgic, its multiplayer mode is where it shines. Matchmaking works well, putting players into similarly leveled teams. Perks and level bonuses don't affect core gameplay, a good headshot will take anyone down. All of these things are just the makings of a cool CoD game, but CoDOL also has some interesting features that it's picked up from other online games. Among the various team modes are Team Rescue and Team Boss Fight, where players fight against AI opponents while trying to rescue computer controlled NPC's. Both of these modes are a delight to play, especially Boss Fight. While it's called Boss Fight, it's not exactly that, it's more or less Team Rescue but with aliens/zombies and a giant alien space ship. The focus is to kill hordes of incoming alien/zombie creatures while moving NPCs to helicopter pickup points. At a point in this mode, a giant space ship shows up and you have to blast it out of the sky with a rifle. This mode is a lot of fun. A lot of fun. Course, with all the good, there has to be some bad involved, otherwise I would've said this game was perfect. Perhaps the biggest fault of CoDOL is the voice acting. This is probably due to personal preference, but the voice acting is terrible. You think Peter Dinklage was bad? Wait till you listen to Chinese voice actors. Not to say that Chinese voice actors are bad, there are lots of Japanese anime that have great Chinese dubbing, but those were done in Taiwan, Hong Kong and Singapore, with Southern Chinese voices. Listening to Soap and Ghost talk like they're Northern Chinese just felt derpy. The thing with nostalgia is, it can only go so far. Sure, old-time burger joints are the bomb, but Johnnie Rockets is only good once in a while. The same can be said about recycled art assets and voices. Many of the maps I played on CoDOL were rehashes of old maps found in the Modern Warfare series. It was cool to see them again but I was looking for more. Ditto with the voices that go "changing mag." It's odd that the game where most of the dubbing is in Chinese, has people saying "changing mag" in English. Of course, I can give this a pass since this is still a beta. To be honest, at first I didn't expect much from CoDOL. It looked like another terrible money grab by a Western studio trying to cash in on China's market. Instead I was very surprised. In fact, after complaining about how long it's taken Activision and Tencent to put out the game (even with all of its recycled assets), I can say I'm eager to see what the final product looks like. Shame there won't ever be a Mac version. Oh... one last thing. CoDOL and Tencent got Captain America actor Chris Evans to plug the game! Here's Evans in the CoDOL trailer in China.